We all know about B-2's and F-117's, and could see how they might be described as "disk-shaped" if viewed from the appropriate angle. Here's some other information about some similar aircraft from the past. They are presented here merely to show that disk-shaped flying craft are not only possible, but have been built. XB-35 - In response to the possibility of Britain falling in the early stages of WWII, the US Army Air Force began taking designs for extremely long-ranged, heavy-bomb-load aircraft that could fly from North America to Germany and back, carrying 10,000 pounds of bombs. Northrop proposed the XB-35. The XB-35 had 4 engines, each driving two counter rotating pusher propellers along the same shaft (!). Pictures of the XB-35 look like each shaft has a six-bladed propeller, but its actually two three-bladed propellers -- for a total of 8 propellers. Jack Northrop had been experimenting with flying-wing designs since the early 1920's. In Germany, the Horten brothers (see below) were working on a flying wing as well -- the final designs look surprisingly like the XB-35 (though it had only two propellers). Northrop's first prototype was the N-1M (nicknamed "the Jeep"), which was tested in the Roseman Dry Lake in the Mohave Desert from July 1940-early 1942. It had two pusher propellers, and space for one pilot. Wingspan was 38 feet, and the plane weighed 4,000 pounds. First "public" flight made the newsreels. The wings were altered significantly as testing went on; for instance the "drooping wingtips" were discarded early on. The (only) N-1M stills exists, and has been restored, it is now sitting in a Smithsonian storage hangar, painted its original brilliant yellow. On June 25th 1946, the XB-35 was at last ready to fly (after a number of difficulties with the propellers) at Hawthorne Field, CA -- the Northrop company field. The '35 was now in competetion with what became the Consolodated B-36 as the postwar strategic bomber (interestingly, both planes were pushers.) Its first flight was from Hawthorne to Muroc Dry Lake (later named Edwards AFB) for additional testing. Attempts to make the propeller system less complex were generally unsuccessful. Northrop decided to replace the props with 8 jet engines, and continue work on the plane, renamed the YB-49. Only 2 XB-35's were ever completed, the second one first flying on June 26, 1947. The Martin Corporation worked on the YB-35 (same basic plane, just built at Martin), and the only YB-35 first flew on May 15, 1948. The power problems of the XB-35 completely disappeared with the jet engines of the YB 49, but unfortunately they reduced the range of the plane such that it could not be thought of as a strategic bomber (mid-air refuelling not then being feasible). On April 26th 1948, the YB-49 flew 4,000 miles with a 10,000 pound payload, on circuitous route that took it as far east as Phoenix, and as far north as San Francisco. In June, 1948 a YB-49 on a routine test flight crashed (Capt. Glen Edwards, for whom Edwards AFB is named, died in this crash, along with four others); specific cause of the crash was never determined; structural failure was the most likely reason. The military had expressed an interest in a reconnaissance version (with two extra jets) of the YB-49, called the YRB-49, and placed an order for 30. In January 1949, though, this order was cancelled. In Feb. 1949 the remaining YB-49 flew from (now) Edwards AFB to Andrews AFB in record time (just over 4 hours - the record was broken the next day by the XB-47, its medium-bomber competitor, which flew almost 100mph faster). The famous YB-49-over-the-Capitol photos are from this flight. President Truman toured the plane's interior on the ground, and then '49 headed back to Edwards. During the flight, 6 of the 8 engines failed due to an oil failure which has a slightly mysterious history (apparently the oil reservoir had not been filled properly before the flight -- there are hints of sabotage). The YB-49 made an emergency landing at Winslow AZ. 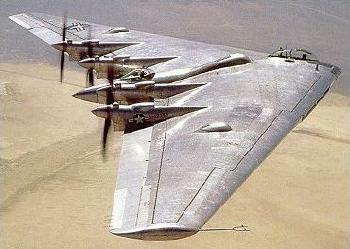 Later on in 1949 the last flying YB-49 was destroyed during high-speed taxi tests, when the undercarriage collapsed. Jack Northrop resigned from the company he had built after the YB-49 was cancelled, and left the aircraft industry entirely. In the mid-1970's, NASA sent him a letter that they were re-examining the flying wing idea (also, the YB-49's small radar signature was being taken more seriously by then.) In April 1980, he (suffering now from Parkinson's disease) was given a security clearance, taken to Northrop, and shown a model of the B-2. Makes a nice ending to the story, eh? 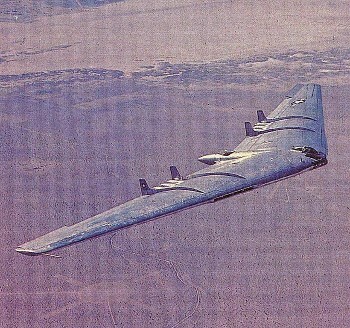 The B-2 has exactly the same wingspan as the YB-49 (172'). Ho III - 1938 - a metal-frame glider, later fitted with a folding-blade (folded while gliding) propeller for powered flight. Ho IV - 1941 - a high-aspect-ratio glider (looking very like a modern sailplane, but without a long tail or nose). Ho VII - 1945 - considered the most flyable of the powered Ho series by the Horten Brothers, it was built as a flying-wing trainer. (Only one was built and tested, and 18 more were ordered, but the war ended before more than one additional Ho VII could be even partially completed. Ho IX - 1944 - the first combat-intended Horten design, it was jet powered (Junkers Jumo 004B's), with metal frame and plywood exterior (due to wartime shortages). First flew in January 1945, but never in combat. When the Allies overran the factory, the almost-completed Ho IX V3 (third in the series - this plane was also known as the "Gotha Go 229") was shipped back to the Air and Space Museum. The V173 (the first prototype version) was built by Chance-Vought. Boon T. Guiten was its first test pilot. Its first flight (November 23, 1942) lasted only 13 minutes, but was entirely successful, and testing continued. One of the later-on test pilots was Charles Lindberg, who was an enthusiastic supporter. In July 1944, the Navy ordered two more "Skimmers" built for further testing, each equipped with significantly more powerful engines (1350hp Pratt and Whitneys -- the V173 was judged underpowered, since its top speed was not up-to-spec). The two new planes were built from "metalite", a composite material made from sandwiching layers of aluminum and balsa wood. These planes were designated F5U's. The Avro (Canada) "Avrocar" was an outright flying saucer. It used three Continental turbojets, turning a central impeller ("turbo rotor") to keep it airborne with downward thrust, with a vane/shutter system to propell the craft in pretty much any direction by venting thrust in any direction desired. It was built to hold two human crewmen in separate cockpits on either side, facing front - total width of the Avrocar was 18 feet, with tricycle landing pads or wheels for undercarriage. It was first proposed in the early 1950's by the Avro company to the Canadian government. The maximum expected airspeed was originally about 700mph. As Avro worked on the design, expected airspeed dropped to 300mph. By the mid-50's, a very-secret project (unknown to even most Avro employees) was in full swing to build the Avrocar. The blades of the Avrocar turbo-rotor were hollow with internal re-enforcing, and brazed to cement the parts. The first turbo-rotor was tested for 150 hours without mishap. By 1955, the costs of the project had escalated beyond the resources of the Canadian government. The project after that was underwritten by the US DoD (the USAF and Army were both interested.) The Avrocar first flew with a pilot on Dec. 5, 1959 (prior to that, it was tested unmanned). Two were built - one Avrocar was tested out at the Ames research center in California, the other remained with Avro for testing. Although the aircraft did fly, its ability to rise and top speed was extremely disappointing, mostly due to thrust dissipation in the impeller. The Avrocar was able to clear (small) obstacles without difficulty, but maximum altitude was never more than about 6 feet! The project was quietly closed down. Curiously, the Avrocar's technology was within a hair's breadth of being successful. Using almost exactly the same propulsion setup, the British developed hovercraft (the first being the British SRN-1) in the early 1960's -- basically an Avrocar propulsion system with a rubber skirt, which greatly improved the use of downward thrust. Edmund Doak also was contracted by the USAF to develop disk-shaped airfoil aircraft in the 1950's and .960's. His last and most promising, the Doak-16, was canceled by the US. [Of course, one other "Flying-Wing-type" plane existed in the German Luftwaffe - Alexander Lippisch's-inspired Me-163 rocket-powered interceptor, and its intended successor, the Messerschmitt P.1111, a turbojet-powered fighter. At the end of the war, Lippisch was engaged in supersonic-fighter research, models of his "P12" were shipped back to the US for analysis. The "Zimmer Skimmer" (aka "The Flying Pancake") - in an attempt to develop a high-speed interceptor (fast enough to overtake diving enemy planes) to deal with Japanese kamikaze attacks, the Navy asked for bids for such an aircraft in early 1944. (The Chance-Vought F4U Corsair - and the Grummann F4F and F6F - eventually filled this bill more or less, but were hard to land on carriers, for weight and pilot-visibility reasons). Minimum speed desired was 450mph, then-available planes would do only about 400mph. Northrop was contracted by the US Army Air Force Materiel Division to build one XB-35 (wingspan 172'). The N-9M was the first product from the contract, a 1/3 scale (working, though wood-structured, not metal) model with two engines with a 60' wingspan as a testbed/trainer. It first flew successfully on Dec. 27, 1942. Three other N-9M's were built, and the N-9M test program was completed in Oct. 1944. [The last surviving N-9M is being painstakingly rebuilt by the "Planes of Fame" Museum, in Chino, CA] One of the N-9M's crashed during testing. Sources: Documentary "The Wing Will Fly", a 'Wings' documentary on "Strange Planes", and "Winged Wonders", by E.T. Wooldridge, published by the National Air and Space Museum, 1983, "In Search Of" episode "UFO Coverups".